This is the corner of Golf and Meacham Road. 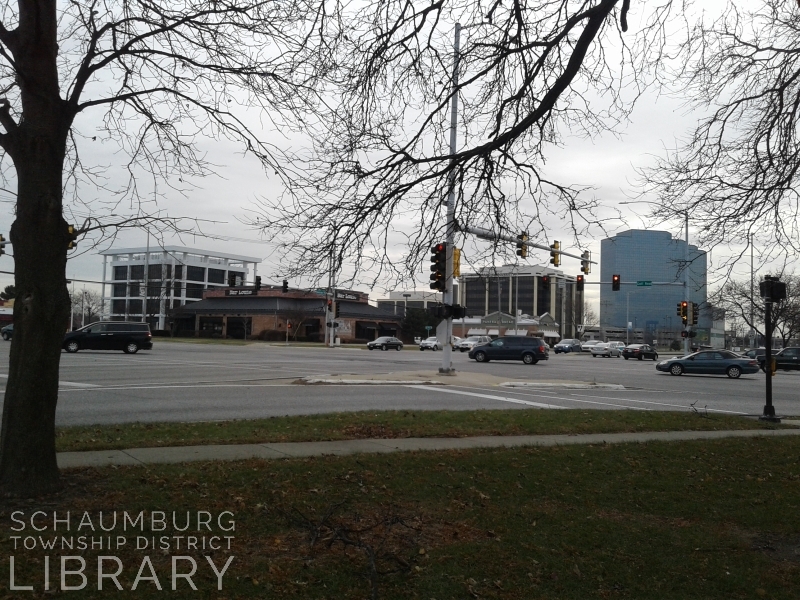 It is one of the busiest spots in Schaumburg Township. But, when Ebenezer Colby paid cash on September 1, 1845 for the land patent on this property at the United States Land Office in Chicago, it was nothing but open grassland as far as the eye could see. Ebenezer Colby was born October 16, 1788 in New Hampshire. His wife, Abigail Hurd Willey, was born on January 19, 1791 in the same state. They married March 3, 1811 and had their children in Manchester, Vermont. The children were born between 1812 and 1831 and included Abigail, Ebenezer Franklin, Lucy Philenda, Rachel Horatia, Marietta Belinda and Almira “Myra”. By 1845 the Colbys had purchased their Schaumburg Township patent and were farming their land in Section 12, which is in the upper right portion of this 1842 map. They bought the parcel that is the left half of the lower quarter and is a total of 80 acres. In 1847 Eben continued his political prominence when he was elected one of five delegates to the Illinois Constitutional Convention in Springfield. Interestingly, according to Marilyn Lind, in her book Genesis of a Township, Mr. Colby promoted a resolution that eventually passed and allowed for 5000 of the 50,000 copies of the Constitution to be printed in German. Could this have been a reflection of the high percentage of German settlers in the Schaumburg Township area? Additionally, he also was one of seven “nays” in the final vote on the constitution. This begs the question, why would he have opposed it? Mr. Colby also began to immerse himself in various posts in local government as township supervisor, assessor and chairman. This was no strange consequence as his neighbor, Daniel H. Johnson, had served in the post of township supervisor before him. We don’t know how long the Colbys remained in Schaumburg Township but, at some point they moved to Elgin, most likely maintaining their property here for a few years. It had to have been sometime in 1855 after he’d finished his service as a Schaumburg Township government official or in the following year of 1856. We know the latter date because, in the book, Death Records in Elgin, it states that Abigail Colby died in Elgin on November 11, 1856. She was subsequently buried in the Channing Street Cemetery in Elgin. Ultimately, the marriage proved to be successful and, in fact, Myra completed legal training with the hopes of serving as a practicing attorney. 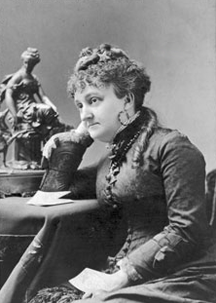 It took until 1892 for her to become one of the first–if not the first–woman in the state of Illinois to be admitted to the Bar. Various sources differ on who attained this dramatic achievement but it is a definite possibility that it was Myra. Meanwhile, Eben Colby continued his residence in Elgin after his wife’s death and was listed there in the 1860 census. 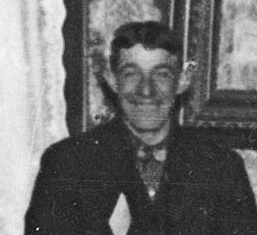 He was 73 years old and his profession was listed as “carpenter.” He was living with Emily Burlington, “a female black laborer” (who was mentioned as such in the 1850 census) and a 65 year-old widow named Malinda Hall. It is also worthy to note that on the 1861 Van Vechten plat map for Cook County, the Colby property in Schaumburg Township had been sold and was now in the hands of J.T. Thomas. Eben then, at some point, made his way to Fort Dodge in Webster County, Iowa where his daughter, Marietta “Mary” (Colby) Haviland lived. We then meet up with him again in the same book where we last saw his wife, Abigail. It is there, in Death Records in Elgin, that he is listed as having died on September 4, 1869 in Fort Dodge, Iowa. He was 80 years old, 10 months and 12 days. The family obviously regarded him highly enough to have his remains sent back to Illinois to be buried in the same block of the Channing Street Cemetery as his wife, Abigail. It could have been their daughter, Myra Colby Bradwell, who was living in Chicago with her husband, who was also an attorney, and probably able to afford the cost. Unfortunately, the Channing Street Cemetery no longer exists so we cannot capture a photo of the Colby’s gravestones. In 1889, twenty years after Eben Colby’s death, when most remains from Channing Street were reinterred in the new Bluff City Cemetery, it is noted in the records that the Colbys did not make the move. 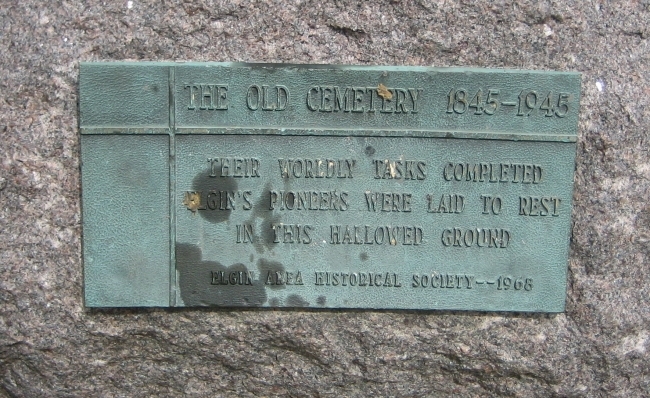 It is quite possible there was no gravestone for the couple and their grave site could not be determined or, very little remained if there was. Suffice to say, the Colbys definitely made their mark on Schaumburg Township–from purchasing the available land patent, being actively involved in state and local government, to parenting children who were notable in their own right. It was an active time in the early, formative years of Illinois and, even though the Colbys were not young people when they arrived, they made the most of the time they had. Without Mr. Colby and his participation, Schaumburg Township might, in fact, be Lutherburg Township. And try to imagine that on the Schaumburg Township sign on Illinois Boulevard! The Schaumburg Township Historical Society will sponsor an open house of the Schaumburg Center School on Sunday, May 27, 28 and 29, 2017. The open houses will be held from 9 a.m. to 4:00 p.m. The schoolhouse is located on the St. Peter Lutheran Church property. 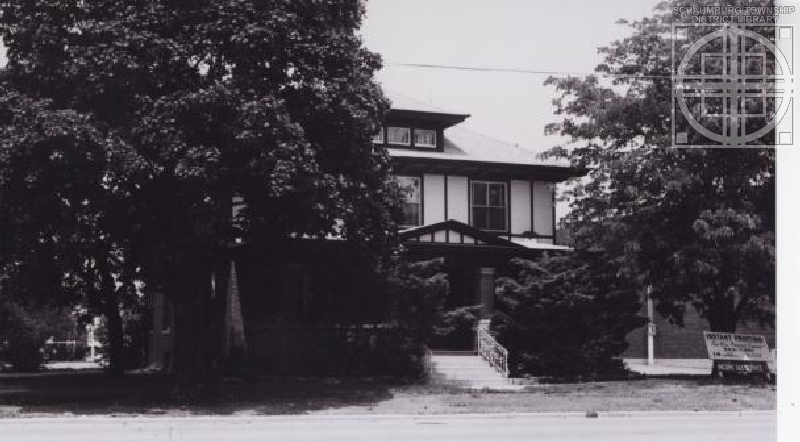 Constructed in 1872–and first called Sarah’s Grove School, it is believed to have been the first of five public schools in Schaumburg Township. 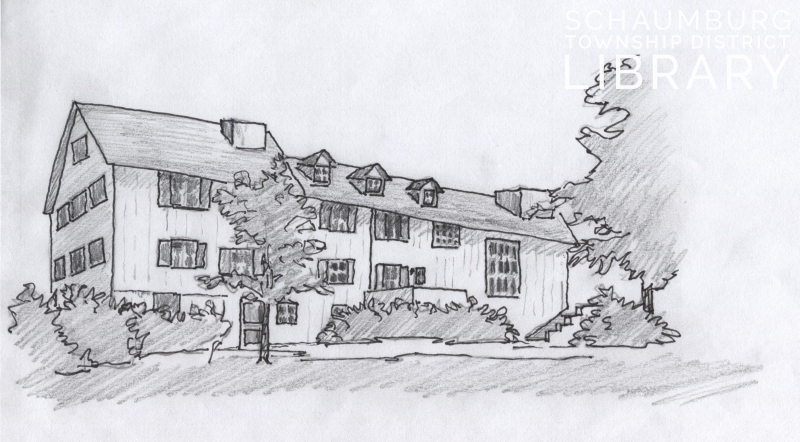 It was later renamed Schween’s Grove School and called Schaumburg Centre Public School until 1954. For 82 years, the building served as a one-room schoolhouse, and was the last active one room schoolhouse in District 54. With the widening of Schaumburg Road, the building was saved from demolition and temporarily placed on the grounds of the Town Square Shopping Center in 1979. It was permanently relocated to the St. Peter Lutheran Church property in September, 1981. It has been fully restored as a museum and is under the auspices of the Schaumburg Township Historical Society. Every once in a while I receive a photo that is difficult–or maybe impossible–to identify. In this case a local gentleman dropped off two photos with the hopes of giving them a good home since they do not depict any of his family members. The photo of the twin baby girls had names on the back and was easy enough for him to confirm. But the other one, a confirmation photo of a young lady, has been a struggle. The photographer on the photo is Mosser from Palatine so, clearly, the young lady is a local girl. Here’s where it gets interesting though. The photo, oddly enough, has two names on the back. They are “Milly Mess” and “Helena Mueller.” They are written in two different handwritings and in two different colors of ink, with Milly’s name more in the center of the photo. Where to start? Recognizing the Mess surname, I contacted a member of the family who, indeed, acknowledged her aunt was Emilie (Quindel) Mess or “Millie” for short. 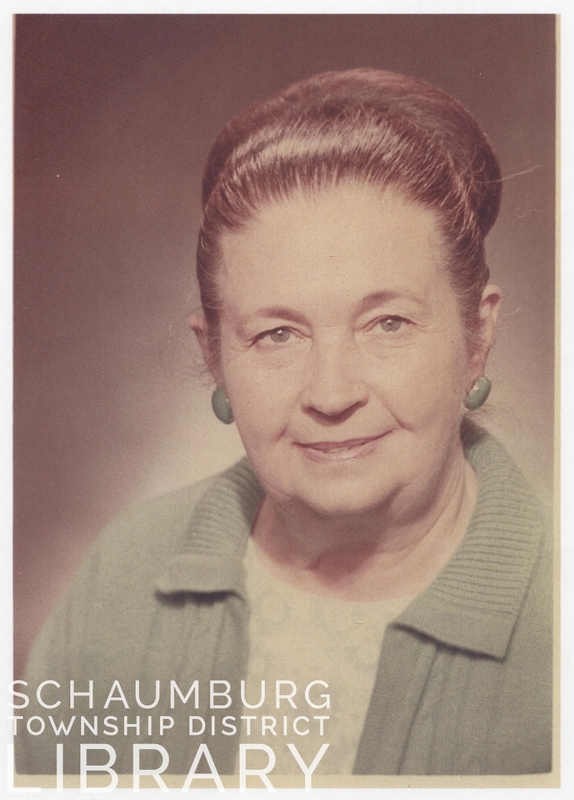 Emilie was born on May 14, 1889 in Schaumburg to Charles and Caroline (Busche) Quindel. 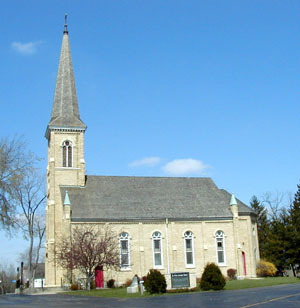 According to confirmation records for St. Peter Lutheran Church, Emilie was confirmed in 1902 around the time she turned 13. Given the length of the dress in this photo, it is quite probable this photo is from that time period. Millie married Otto Mess at age 21, eight years after the confirmation photo was taken. Below is a photo we have of Millie in our Local History Digital Archive. She is clearly older than the young lady in the confirmation photo. Do the two photos depict the same young lady? The dates for Millie certainly align with the confirmation photo. Information for the other young lady took a bit more effort to track down. Mueller can be spelled so many ways in government and church records–Muller, Miller, etc. I tried the census for the years 1900-1920 and did not have any luck. I also tried variations on the first name–Helena, Helen, Helene, etc. I then tried a simple search of Helena Mueller in the Daily Herald and bingo! There was a reference in an obituary to Helena (Mueller) Heine. Additional obituaries mentioned that she was married to Oscar Heine. With such a distinctive first and last name, I tried searching for him on findagrave.com and there he was. And his wife? Rosa Helene “Helena” Muller Heine. With a photo included on the page! I’d obviously hit the bonanza. And I’ll be darned if she didn’t look very similar to our young lady in the photo above. The problem is that Helena was born February 17, 1882 in Germany. 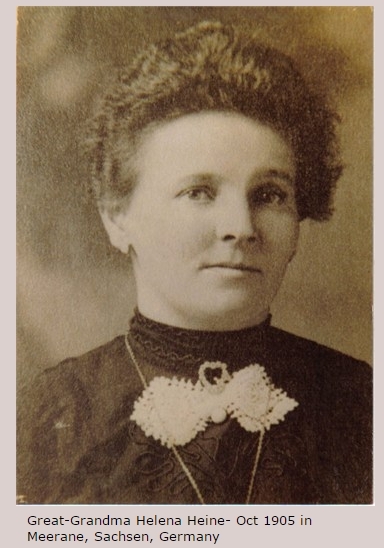 In talking to the descendant who posted the photo and data on findagrave.com, I was told that Helena was confirmed in 1897 and came to the United States with her husband and son after marrying in 1905. The photo above was taken in 1905 when she was 22 or 23, probably around the time she married. Given her time frame and all of these details, it’s very unlikely that she is the young lady. So, the mystery remains. Is it Millie? Or more remotely, is it a relative of Helena? Taking a bit of a closer look at the confirmation photo, it looks like the girl’s nose tilts downwards. Millie’s nose does the same thing. Helena’s seems to tilt upwards. However, the young lady’s hair appears to have some wave and curl to it just like Helena’s. In the confirmation photo, the young lady looks more sedate and relaxed. Millie looks more tense and staunch in her photo while Helena has the same relaxed expression as our mysterious young lady. Until someone comes forward with another copy of the photo it appears we cannot definitively identify the young lady. Whoever she is, her mother must have lovingly sewed her dress–and ironed it!–for the occasion. It’s probably a safe bet that those are new shoes too. Confirmation was a special moment in a young Lutheran girl’s life and it would be a shame to leave her unidentified. The photo of Helena is used courtesy of the contributor to Helena Heine’s findagrave.com listing. My thanks to C. Debenport for posting the photo and passing on more info about Helena. She shared wonderfully researched information with me as I created this blog posting. 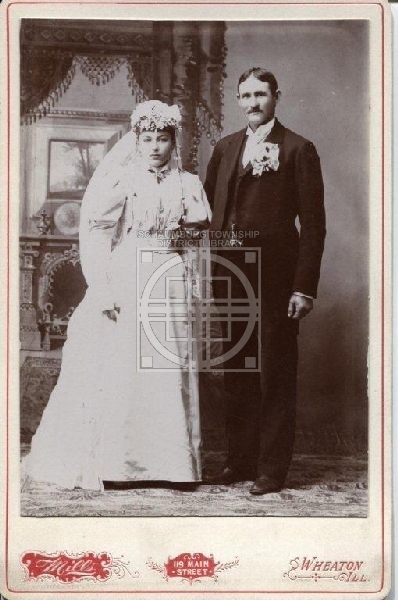 In April 2011 I wrote a blog posting about the large wedding between Fred Pfingsten and Emma Rohlwing that occurred on September 3, 1903. It was quite an event, and was so big and festive that it was written up in the Chicago Inter Ocean magazine. That accounting has stood the test of time and continues to pop up in the German history of Schaumburg Township. The wedding was a three day event and so big it was reported in not only the Palatine Enterprise but the Duluth News-Tribune, Fort Wayne Journal Gazette, Freeport Daily Journal, Sandusky Star Journal and Oakland Tribune to name a few. Clearly, word got around. Henry and Lucy invited over 250 families–which equaled nearly 1000 relatives and friends. Four large tents were erected in order to accomodate a buffet meal, dining, cards and dancing. Mrs. Hartmann was the caterer and oversaw the cooking while other ladies from the township helped serve the meals. The food on hand included: 1200 pounds of meat, five barrels of sauerkraut, 160 pounds of head cheese (a type of sliced cold cut that includes bits of pork jelled with a delicious broth and firmed in a mold), three tubs of potato salad, 50 kegs of beer and 100 gallons of gooseberry shrub. 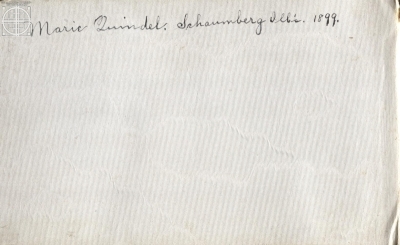 This latter item was also served at the Rohlwing/Pfingsten wedding and, according to one of the commenters below, seems to have been a drink that was possibly fermented. The dining tent could hold 150 people while the card tent was set up with tables for games of pinochle. The dancing tent was 50×80 feet and covered with a smooth dancing floor specially laid for the occasion. The Bartlett Blue Ribbon Band proved its worth yet again by providing the music for the dancers. Yet another piece of enjoyment for the bride and groom was the opportunity to take a ride in a new 25 horsepower automobile driven to the festivities by Louis Althen, president of the Elgin Brewing Company. He gave them a ride at top speed around the township. Obviously, not everyone could fit in the tents so the large lawn of well mown grass and the orchard provided other relaxing options for the many guests. By all accounts the weather was gorgeous and in full cooperation for the three days. Who could ask for anything more? 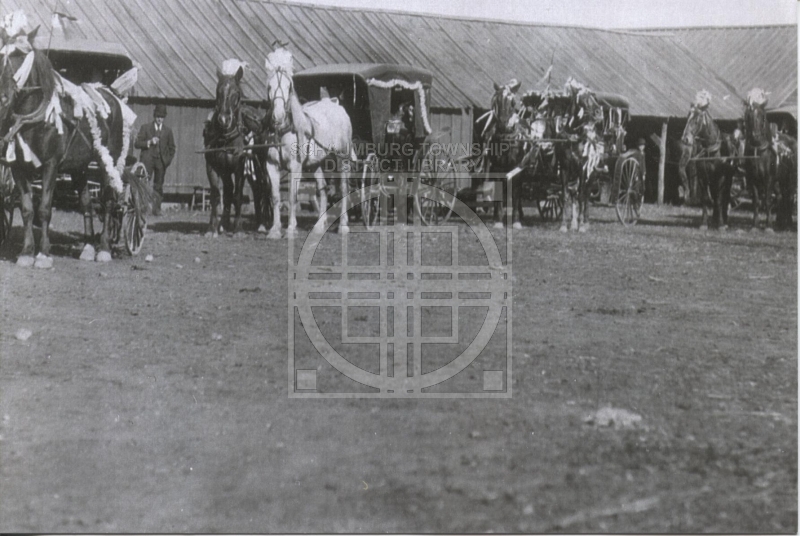 Mr. and Mrs. Lichthardt began their married life at a new house on their 140 acre farm. Love must have been in the air during those three days in September 1905 because Mrs. Licthardt’s sister, Della, married Mr. Licthardt’s brother, Fred, a mere one year later on November 1, 1906! 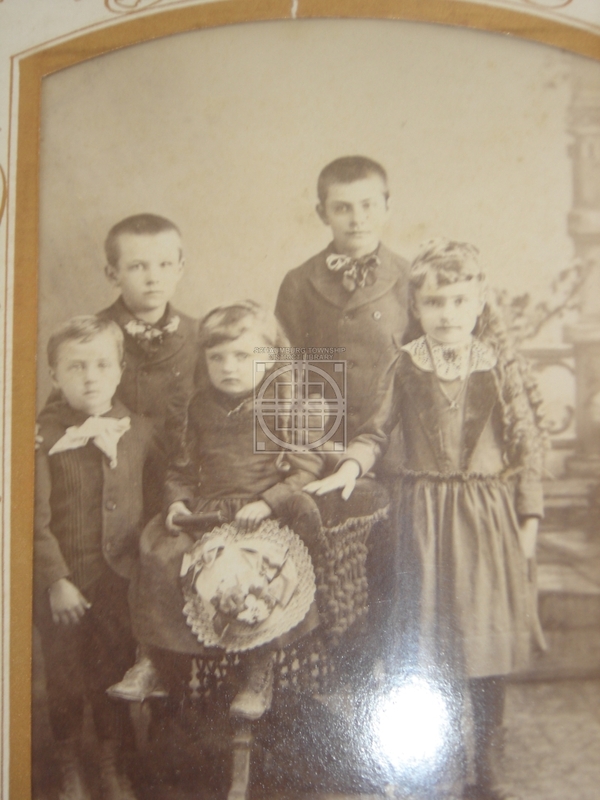 Every once in a while descendants of some of our German farm families will pass on their unidentified photos with the hope that someone can put a name(s) to the people in the photo. 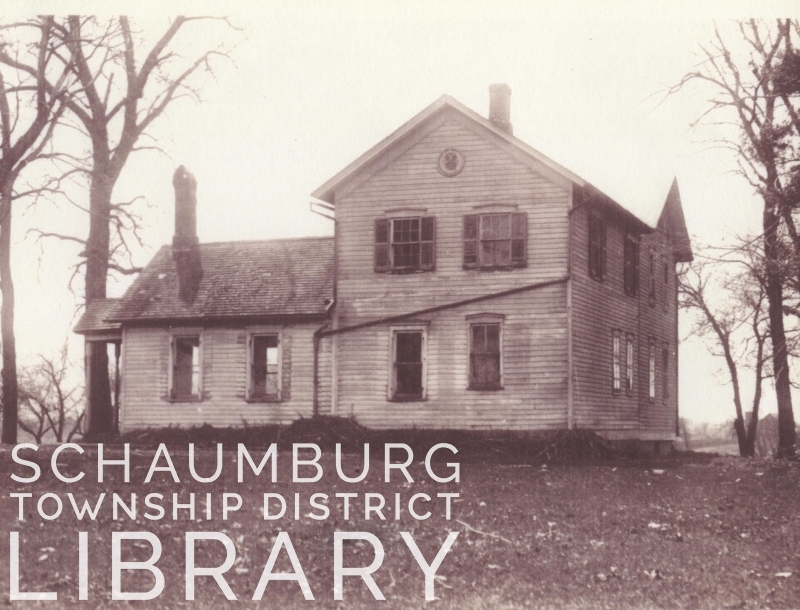 I post these photos on the the Schaumburg Township District Library’s Digital Archive in the hopes that another family member may own the photo and can help us out. 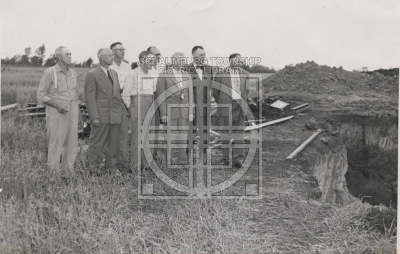 I now have a collection of these photos for three families–the Meyer, Panzer and Sunderlage families. How do I know these photos pertain to the individual family? I can’t be absolutely certain but the family member or interested party has usually had the photos for a while. 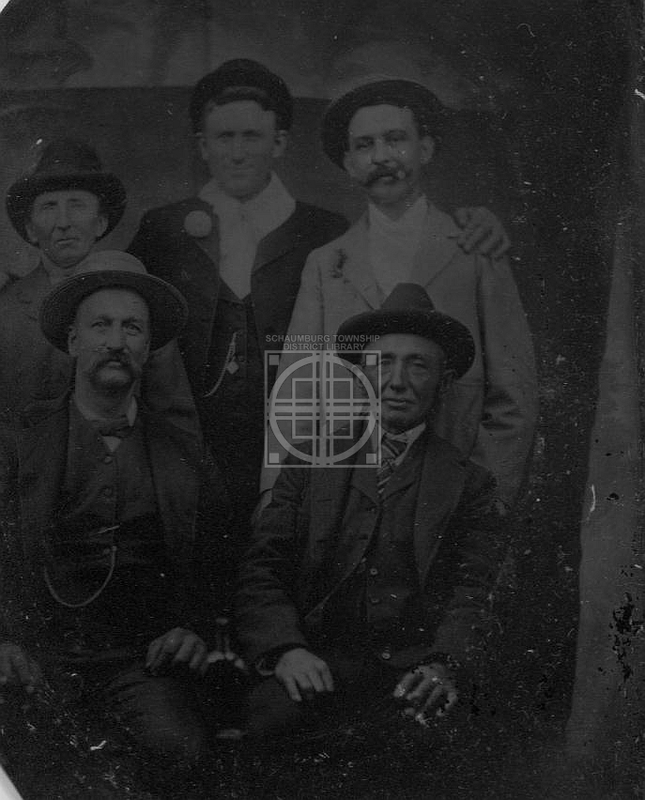 They can either put a name to some of the faces or the photos are clumped with others from the family. For instance, the Meyer photos were passed on to me by someone who tracks Schaumburg Township genealogy. A gentleman from the Meyer family knew of the genealogist’s work and gave him a photo album which he, in turn, passed on to me. The Panzer photos were shared with me by a member of the Panzer family who had the photos in her possession and was hoping someone, anyone, would help her with the identifications. As far as the Sunderlage photos go—these were passed on by the Sunderlage House Archives of the Hoffman Estates Historical Sites Commission. 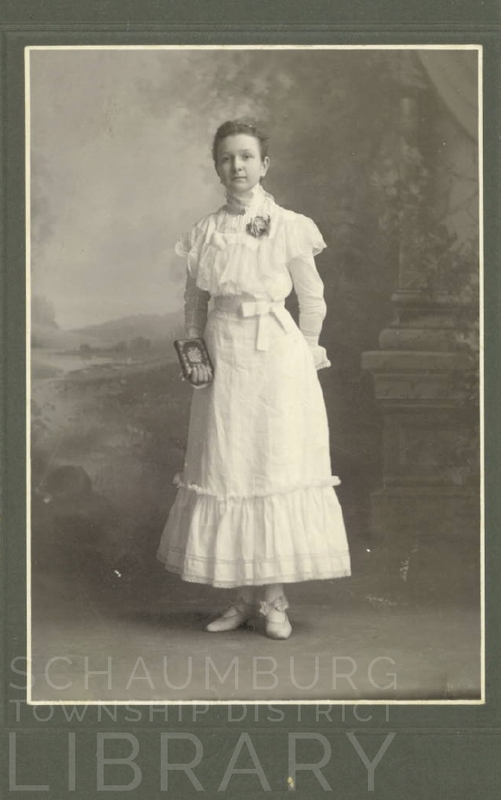 The Meyer photos consist of three newly married couples from the early 1900s, one child, a young man, two young women and four confirmation photos of 13-14 year-old young ladies in their white confirmation dresses. The wedding photos show the brides in white dresses—something that didn’t happen until after the turn of the century. The Panzer photos consist of five individual children, two sibling photos (one with five siblings dressed in their finest), three wedding photos, an older couple, a young lady, five confirmation photos of 13-14 year-old young ladies and one confirmation photo of a 13-14 year-old young man. I have posted some of the photos here but the bulk of them are on the library’s Local History Digital Archive. If you are a family member and curious or have never paid a visit to the Digital Archive, start here. >Go to the individual folders for the families. You will see thumbnails of the photos and can click on each of them to increase the size. If you are a family member and can make an identification, please contact me at jrozek@stdl.org I’d love to be able to move that photo to another folder—and report the change back here. Or, take a look around and see if anything else catches your eye. Maybe you have photos that we could add to the Digital Archive? We are always looking for anything related to Schaumburg Township with no limit on the date. History is history. Businesses, homes, events, people, dignitaries–we’re interested in it all. Contact me at the above email address if you have something you’d like to share. 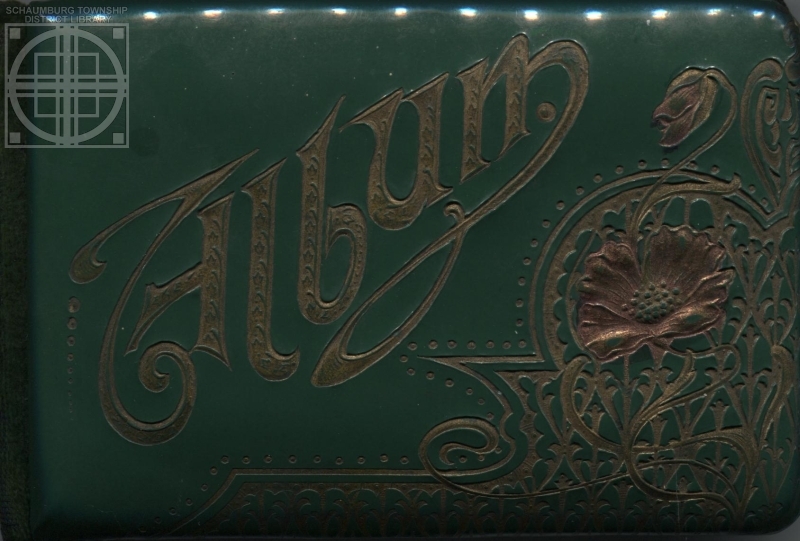 In 1899, eight-year-old Marie Quindel of Schaumberg, Ill’s was given this small keepsake album. The intent was that her friends and family could record messages for her to remember them by. Some of the messages are in English. Some are in German. Almost all of them rhyme and give advice. 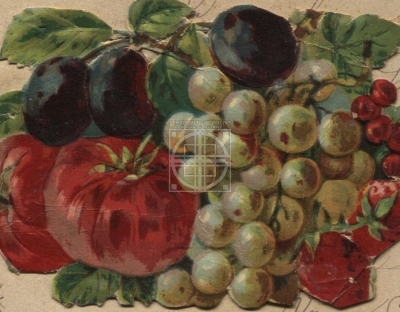 Many include beautiful, small cutouts of flowers and fruit that were pasted onto the pages. Marie, herself, put her name on the inside cover along with the older spelling of Schaumburg and the curious abbreviation of Illinois. It is interesting to note that the spelling of Schaumburg varies throughout the book. Dear Marie: When sitting sad and lonely and think you are unloved, remember O remember there is a friend above. Ever your friend, Alma S. Nerge. Some of the others who wrote messages to her in German are: C. Meinke, Alma Lichthardt, and Hermina Rohlwing. 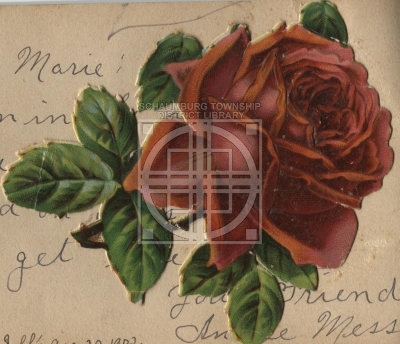 Young Marie was born in 1891 in Schaumburg to Charles and Caroline “Lina” (Busche) Quindel. Her five siblings were: Sophia, Henry, Emilie, Wilhelmine, and Alvine. She was christened, confirmed and married in St. Peter Lutheran Church in Schaumburg. She married Benjamin Meyer in 1914 and they had one child. 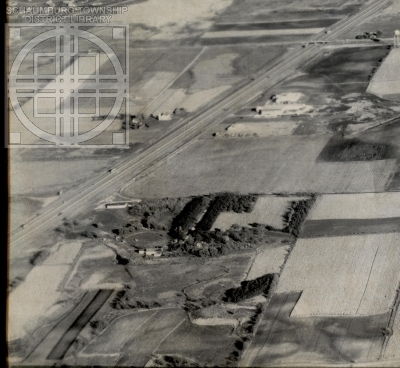 Their farm spanned Higgins Road just west of the intersection with Golf in today’s Hoffman Estates. Her husband died in 1962 and Marie died at the age of 90 in 1981. It is always interesting to have these little treasures come across my desk. Holding the album in my hands and looking at the neat script of the writers, I think of Marie and wonder what made her ask her friends and family to record their sayings over such an extended period of time—from 1901 to 1909. Whatever the reason, it was obviously a prized possession since it was kept over such a long life. Thank you to the Hoffman Estates Museum for sharing. This house is probably familiar to all who live in Schaumburg Township. It is unique for its Queen Anne style and the time period in which it was built. With its distinctive turret, the house can be found at 17 East Schaumburg Road in Schaumburg. 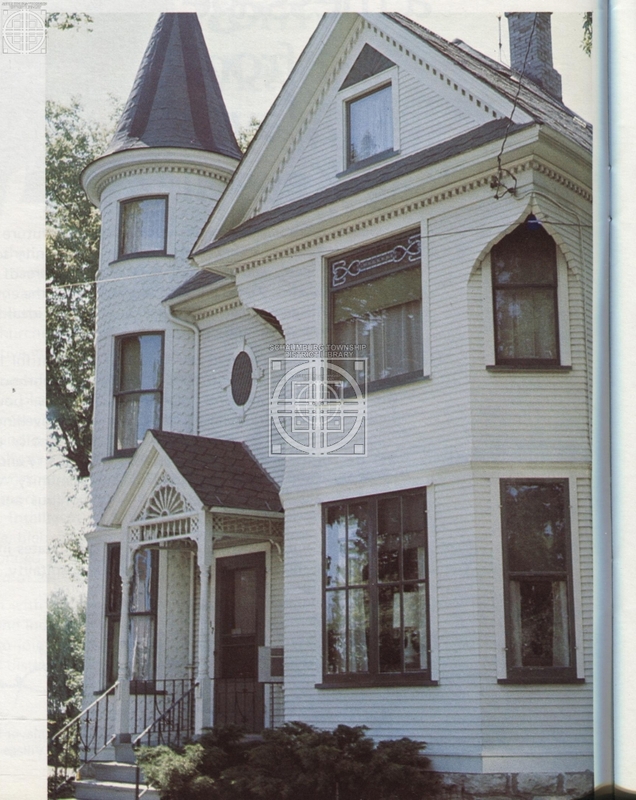 It was built in 1901 by Louis Menke who lived there with his wife, Eliesa “Lizzie” (Pelletier) Menke and their children Meta, Edwin, Frank, Herbert, Arthur and Louis. Over the years he made a number of improvements to the house and some of these were documented in early versions of the Daily Herald. It is presumed Louis built this house as a showplace for his construction skills because, in the following two decades, he quickly became one of THE contractors for Schaumburg Township and the surrounding area. Some of the buildings are still in existence and it is possible to note how varied the styles are. It is obvious, too, how skilled Mr. Menke was. Listed below are entries from versions of the Daily Herald, Genesis of a Township by Marilyn Lind and personal accountings by local residents. It should also be noted that two of Mr. Menke’s grandchildren noted in their oral history that he built many of the barns in Schaumburg Township. 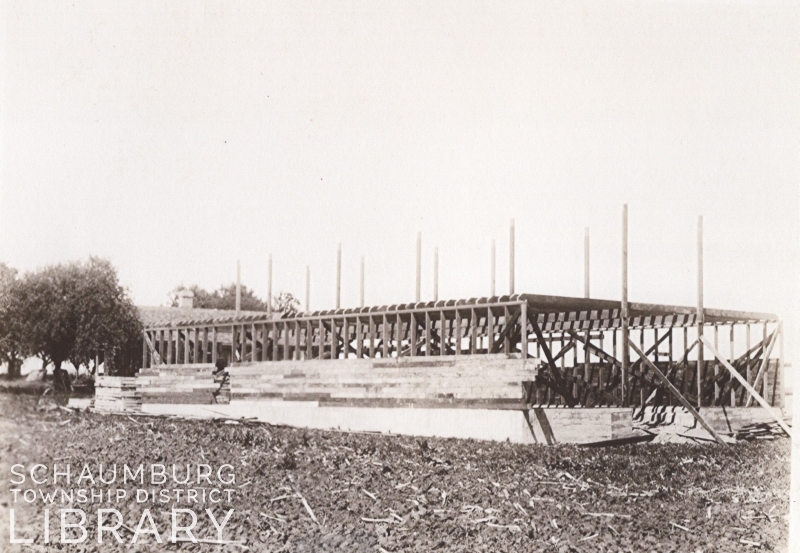 July 16, 1920 Herald Louis Menke and carpenter crew are busy building a large Dairy barn in Schaumburg. On October 7, 1917 Louis and Lizzie Menke celebrated their daughter, Meta’s wedding to Arthur Thiemann by holding the reception in the small barn that is still on the Turret House property today. The Thiemann’s children recalled that their parents told them of the corn shocks and other fall adornments that made the building look special for the reception. Three years later in 1920, news reached the newspaper that Mr. Menke and his family were selling their “fine home” to Henry Moehling from Arlington Heights and moving to 482 Chicago St. in Elgin “where his boys will have a better chance for employment and education.” And, unfortunately, that’s about the time the mentions of any Menke area construction stopped in the newspaper. Fortunately, he and his skills left the area a wealth of buildings. We’re very lucky some of them still exist today. The home was later sold in 1924 to John and Wilhelmina Wille. Upon Mr. Wille’s death, the house was passed on to their daughter and her husband, Emil and Elsie Trost. Subsequent owners were Frederick Reis and Martin Miller. Later the house was purchased by the Lou Malnati’s chain. The house then became the property of the village of Schaumburg in 2010 in a property swap with the pizza chain. It now serves as offices for the village’s Health and Human Services department. 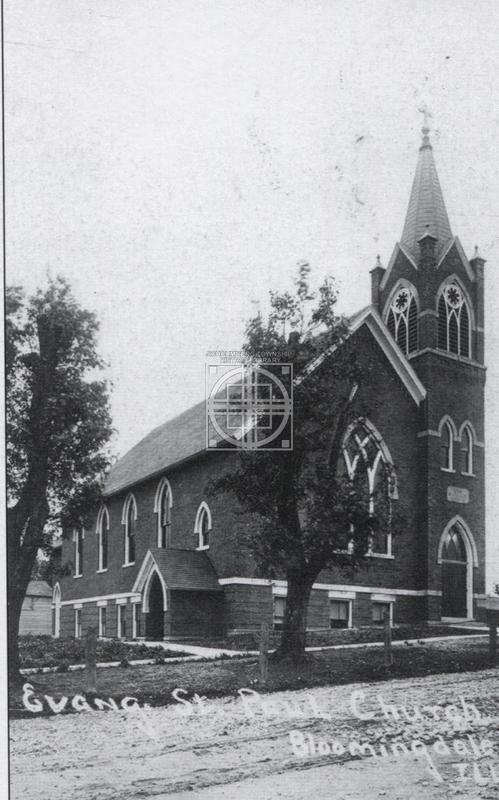 The photo of Evangelical St. Paul Church in Bloomingdale is gratefully used with the consent of the Bloomingdale Historical Society. In 1943 Frank and Loie Wiley were living in Oak Park with their young boys, Robert and Donald. Mr. Wiley was president and owner of Reproduction Products, a blueprint manufacturing plant on Damen Avenue in Chicago. Having grown up in rural Earlville, IL, Mr. Wiley was eager to move away from the big city life and look for something rural. That same year a real estate agent introduced them to a farm in Schaumburg Township. 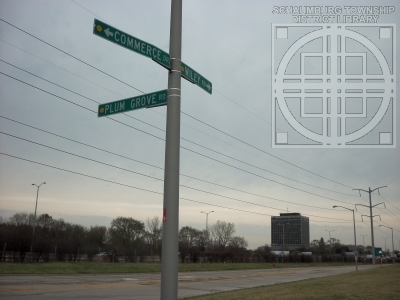 Located off of Plum Grove Road in northern Schaumburg Township, the 80-acres was across from today’s Motorola campus. When the Wileys moved there in 1944 they named the farm Spring Creek for the creek that runs through the property. They continued farming with the help of a farm manager. (According to a Paddock Publications article of February 4, 1954, the manager was Melvis Mossman.) Most of the acreage was used to grow soybeans, corn and wheat or oats. Their boys, with the help of the farm manager, raised purebred Yorkshire hogs and enjoyed showing them at fairs and other exhibitions. Later they switched to the breeding and raising of sheep instead of hogs. In addition, the boys had a pony and a few horses. They were able to run the horses on a small racetrack that was on the farm when they purchased it. The farmhouse was nearly 100 years old when they moved in, except for the large living room addition that had been added on by the prior owner. They began planting fruit trees on the property so that the bounty could be canned and frozen by Mrs. Wiley. She also kept a large rose garden and English-style garden where she grew a mixture of annuals and perennials. And, unlike many of the gentleman farmers of the period, the Wileys lived there year round and sent their sons to elementary and high school in Palatine. In the words of Mrs. Wiley, in a Chicago Tribune article of October 6, 1974, “It was a good place to bring up our two boys. We had 10 good years here before it [development] came.” Not ones to sit idly by and wait for things to happen, the Wileys jumped right in when the development started and became part of the movement that built up both the village and the township of Schaumburg. Whether fortuitous or not, it was also this year that Mr. Wiley sold his plant in Franklin Park. Having looked for property to start another business, Mrs. Wiley said in a July 29, 1965 article from the Herald, “We looked all over for space. In Elk Grove Village, in Palatine, in Rolling Meadows.” The solution eventually became obvious. In a special meeting of the village board, the zoning of a small portion of their property was changed from agricultural to industrial. Following this move, the Wileys began construction of a small, cinder block building that would house the first industrial plant in the township—the Frank Wiley Co.
Next to the recently opened Interstate 90, the company was perfectly positioned to attract business–for themselves and for Schaumburg Township. It was strictly a family-run company that employed his two sons and his wife. They were part of the paper supply industry that transparentized paper by saturating it with a plastic resin. As a sideline, he also synthesized cloth. The company served as the only industry in Schaumburg Township until 1963 when Schmidt Iron Works opened just down the road to the east. Mrs. Wiley was also busy in the early years of the village. She acted as the Schaumburg correspondent for the Schaumburg Party Line column for the Hoffman Herald. 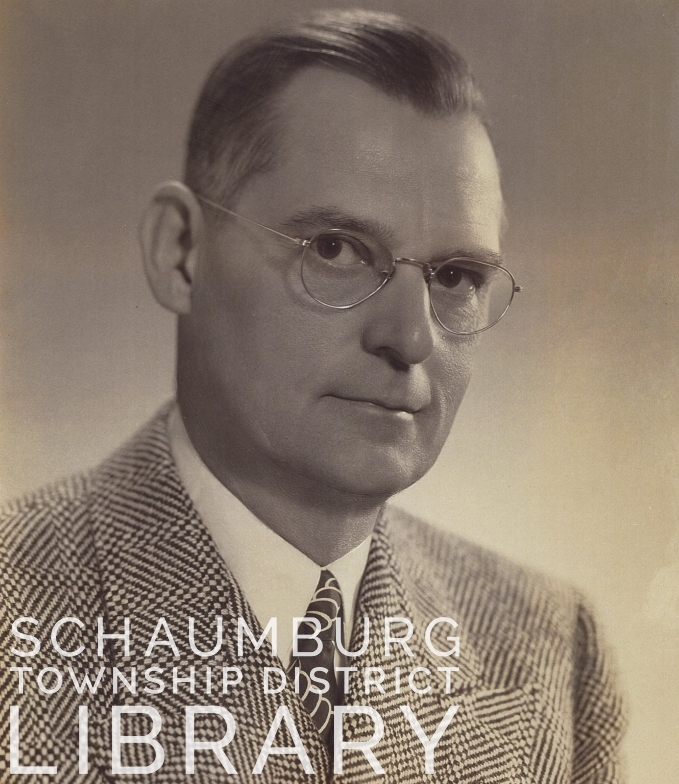 In 1960 Mayor Atcher asked her to serve on both the Schaumburg Planning Commission and as chairman of the village’s library committee. This committee was successful in bringing library service in the form of a traveling bookmobile, sponsored by the Regional Library Association for the Fox Valley, to the village of Schaumburg. 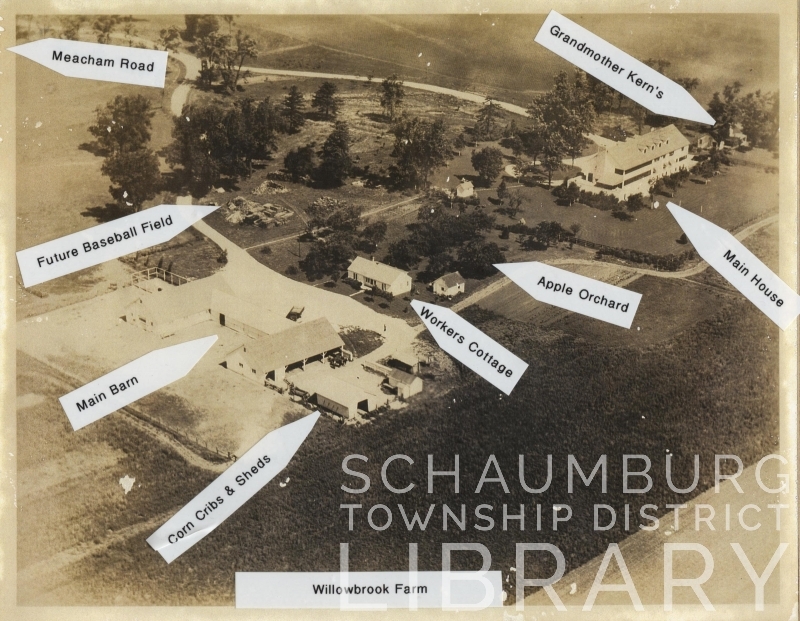 Later, on January 15, 1964, an organizational meeting led by Mrs. Wiley formed the Schaumburg Township Historical Society. She worked with Sara Meginnis, Dru Linnel, Carolyn Smith and Mrs. Rev. F.A. Hertwig of St. Peter Lutheran Church on this project. Then, in 1965 she was appointed once again to head a three-person village committee to look into a possible merger of the villages of Hoffman Estates and Schaumburg–an idea that clearly never came to fruition. Around 1966/67, the Wileys closed their business and in 1969 Mr. Wiley decided not to run again for the village board. The couple continued living in Schaumburg Township but, by 1971, the taxes had gotten too far out of reach to continue farming their acreage. Mr. Wiley tried but could not find anyone to “custom-farm just 80 acres.” (Chicago Tribune, October 6, 1974) As a result it became necessary to sell the property. By the late 1970s, the Wileys had sold their property to the Ridge Development Co. of Schaumburg and had retired to Florida. 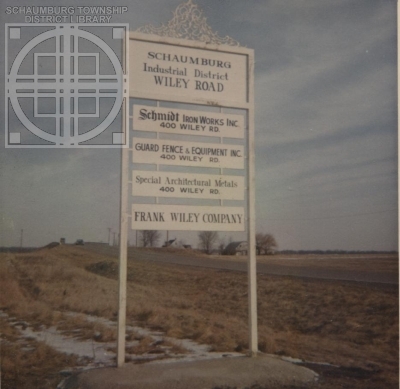 Mr. Wiley passed away in 1990 and Mrs. Wiley, two years later, in 1992.
Who knows what the formation of the village of Schaumburg would have been without the strong participation and dedication of Frank and Loie Wiley? Their time and energy spent on the variety of boards and committees in the village and township was invaluable–and unmeasurable. Heaven knows, our the Schaumburg Township District Library certainly has much to thank for Mrs. Wiley’s service! This posting was written with the assistance of the articles mentioned in the text as well as those from the April 7, 1966 and April 13, 1961 issues of the Daily Herald and from the January 17, 1960 and October 17, 1965 issues of the Chicago Tribune. The Genesis of a Township by Marilyn Lind also proved useful in writing this posting. 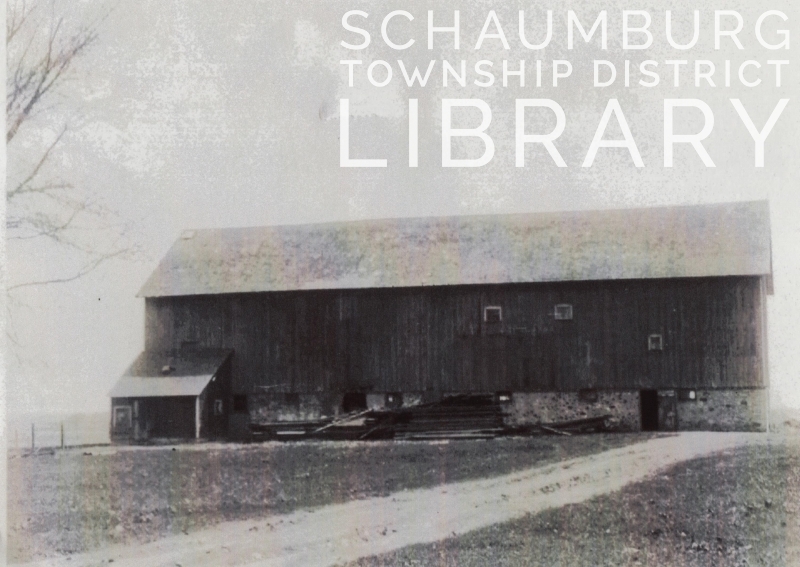 The photo of the District 54 board is used compliments of William Engler and the photo of the sign of the Schaumburg Industrial District is used compliments of the Schaumburg Township Historical Society. Ironic that we can publish a photo of the Industrial District on Wiley Road thanks to the formation of an organization that Mrs. Wiley helped to found!